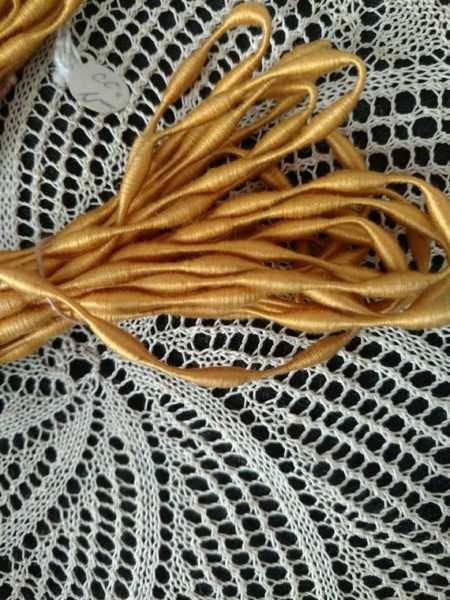 For your sewing basket, needlework project or other craft, a wonderful hank of Coronation braid trim from the early 1900’s – 1920’s. It is old stock, never used, still retaining the original store tag. Still tied with the old string. The trim is in a harvest gold color. It is my understanding this type of trim has not been made since the 1920’s, so here is a perfect braid for completing those coronation patterns featured in so many of the old needlework books and magazines.